(1) Lay a good sized sheet of kitchen foil in a roasting try. (2) Rub the outside of the loin with Garlic Butter, Rosemary, Chilli flakes and season with Salt & Pepper. (3) Fold the foil over and seal the meat in a pouch. (4) Roast at 160c for about 30 minutes until cooked. Don't over cook as the meat will dry out. 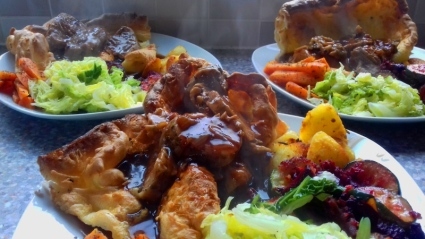 We served ours with seasonal vegetables, Yorkshire Pudding and lots of gravy.